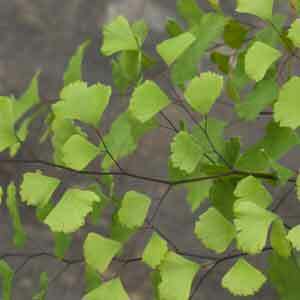 Maidenhair fern with typical black stems. Sprays of triangular fronds light green in colour top these stems of this slowly creeping deciduous fern. Needs a sheltered site in garden but if unsure of hardiness is happy grown in a pot and bought in for winter. Should tolerate temps down to -10C. Height 20-40cm.